Trinidad Scorpion – I Love It Spicy! “This stuff is hurt ya hot,” J-Bru says in his review. I got a nice chuckle at that. 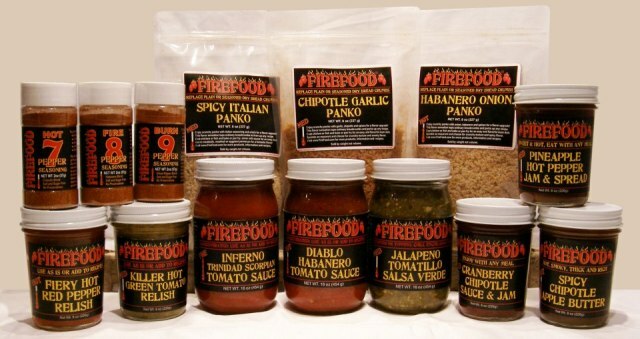 We have done 3 reviews for the company simply named, Firefood over the last 3 weeks, and the heat has steadily increased in each of their products. This tomato sauce as you can see has fresh Trinidad Scorpion chile peppers, and it is certainly bringing the heat to our review team. Is it too much heat? We shall tell you in their videos. Our review team consists of Ken Alexander, Jacob Robertson, and J-Bru aka Josh Bruner. 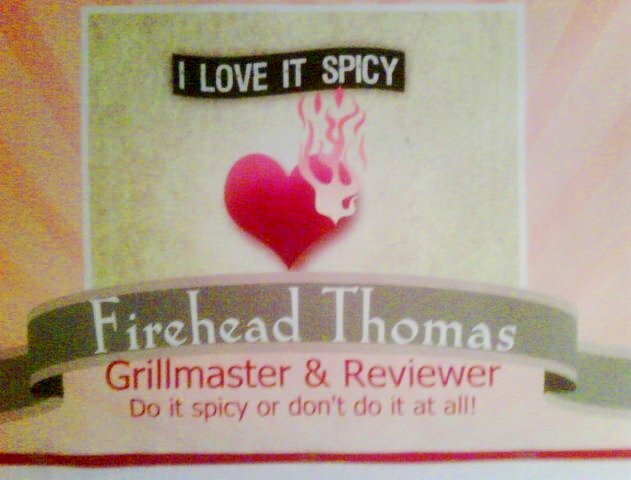 This will be Josh’s last review for ILoveItSpicy as he is moving on to do bigger and better things. In his short time with ILIS, Josh has brought a nice take on the products he reviews. I just love the way he adds in small pics representing each and every ingredient as he reads them off. He will be missed, and will be welcome back with open arms if he ever chooses to do so. Good luck J-Bru! I would also like to thank Elaine from Firefood for letting us highlight her products on ILIS and give our candid take on them. It looks like you are bringing some uniqueness to the community with products that aren’t presently there as far as I know. You can see the list of their product line, and the spicy panko crumbs is definitely something I have never seen before. Kudos to you for that. I wish you the very best with Firefood, and much success to you from here on out. Fear the reaper has a new meaning, and it involves beef jerky. So far in the 4 previous beef jerky reviews for The Jerky Connection, we have had a common theme with our team in their feedback, and that this beef jerky has awesome texture. There are a lot of jerky out that that are too chewy or disintegrates like cotton candy when it meets saliva. It is hard to get the right balance of chewiness along with flavor. Of course, we also want it spicy. The Jerky Connection looks to be delivering all 3 with The Reaper. Using the Carolina Reaper’s heat, they also have other chile peppers featuring Chipotle, Cayenne, Ghost Pepper, Trinidad Scorpion, and 7 Pot peppers added in generous proportions. That is a lot of heat coming for you, so indeed fear this jerky. Will our review team be up for the task? You can also find out for yourselves if you are headed to the Houston Hot Sauce Festival. They will be in attendance this year at the show. So look for them and tell them you saw their reviews here on ILIS. “So here we are…the End is upon us! We figure if the world is going to end, you may as well numb your taste buds first with some scorching jerky. A blend of Sriracha, Garlic, and Trinidad Scorpion, and the Carolina Reaper will mercifully numb the taste buds in this killer jerky, and rock your mouth’s world. A tasty marinade coupled with some destructive heat will make this jerky one of your favorite snacks to await the dreaded cosmic collision! This one seems to be for the chilehead who wants to burn his face off. Before we get to see what happens to our poor review team – Steve “The Machine” Smallwood, Heynetboy & Dale Gilbert – feel free to browse the previous reviews to see why The Jerky Connection has won so many beef jerky awards across the industry. Whilst at CaJohn’s Open House during the Fiery Foods Weekend in Columbus, Ohio we did this special review. Well it is not really a review, but a heat challenge. Thom Toth, the man behind Voodoo Chile Sauces & Salsa, LLC made his first appearance at a hot sauce show. Not as a vendor, but as a chilehead. He brought along some of his hot sauces with him to share with some of the other chileheads in attendance, including this unique product. 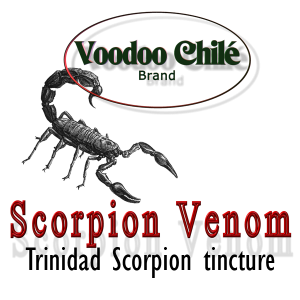 Scorpion Venom is an ultra hot Trinidad Scorpion chile pepper extract of sorts. The difference in this product is that while it packs much heat, it does not have that awful, bitter extract taste because they use a different process in creating it. If you want to heat up your food or want to increase the spiciness of your mild sauces then this is the product for you. Check out what Steve “The Machine” Smallwood does with it. Sick! Ladies and Gentlemen, I want to share with you my new love of cooking BBQ Ribs. Not on the grill, but in the oven. Is it as good as a grill? I think it is as close as you can get. My BBQ grill took a dive off my deck last year, and I have been since without a real grill. I do have a foo-foo grill, but I certainly couldn’t cook a rack of ribs with it. I show off all the BBQ rubs and BBQ sauces I have in my kitchen, and you will be surprised which BBQ sauce I ended up using. In the end, mouth-watering ribs that were saucy, juicy and mmm mmm good! For those who do not know it, the district of Moruga is a sovereign state which lies on the central south coast of Trinidad at the western end of the Trinity Hills. The village is close to Trinidad’s oil reserves, and that and fishing are the area’s main economies. The people are also proud to be in the recent news this past year with some of the huge record breaking hottest chile pepper announcements. Do Super Hot Challenge Videos Help or Hurt the Industry? 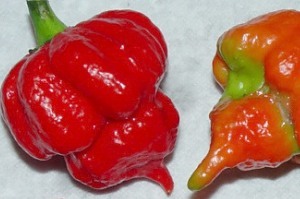 FYI: What is the Hottest Pepper in the World?